Is Cake Boss Based On Haim Saban? While watching Kamen Rider OOO, I could not help but actually be amazed at what I failed to see. The actor Takashi Ukaji looks like Haim Saban. I just thought that perhaps during the time Kamen Rider OOO aired, Kougami Foundation was probably Toei's tribute to Saban Brands. So my next wishful gimmick would be funny is sending Ukaji to the next Power Morphicon. What is also coincidental (if any) is that Kougami Foundation is a multi-purpose company and in real life, Saban also has various businesses in real life. Maybe it's just a coincidence but who knows? Kamen Rider Villain Comparison: Masato Mishima And Dr. Maki As Human Villains Who Threw Off Their Humanity! 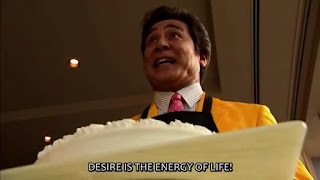 While watching Kamen Rider OOO and Kamen Rider Kabuto, I felt like both villains namely Masato Mishima and Dr. Maki. Though the tones of both series were different but I can't deny how two villains were pretty similar in some way. Now let's take a look at them aside from the fact that they wear glasses. Masato is at first presented as what might be a protagonist, he was part of ZECT and was actively involved in combating the worms. At one point, he was a Kamen Rider using TheBee but he was having his own schemes. He was always shown to be selfish, manipulative and has had been planning to take over ZECT behind the scenes. I always thought that the actor Tomihisa Yuge game this guy the feeling of being the cold antagonist, where he has been a puppet master of sorts in the master between humans AND the Worms. 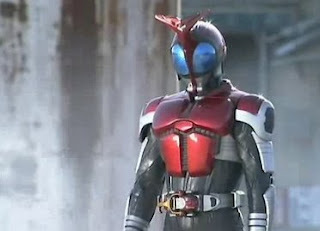 Kamen Rider Kabuto: Is It Shoji Yonemura's And Shinichiro Shirakura's One Shot Wonder? I have just finished watching Kamen Rider Kabuto from start to end (the first, I just watched it on a broadcast which sucked), so I thought is this show the one shot wonder of Shoji Yonemura (as the head writer) and Shinichiro Shirakura (as the head producer) of this show. I felt like this show was pretty weird but it was entertaining enough to keep me occupied. The show's plot involves the alien lifeform known as the Worms have landed on Earth, they mimic people and they were brought by a meteor that crashed some time ago. An organization known as ZECT is formed to combat worms while we have the hero, Souji Tendo who believes he walks the path of Heaven. Souji becomes Kamen Rider Kabuto after seven years of training to fight the Worms while there are some twists and turns along the way.